2012 Vectrix VX-2. Picture credits - Vectrix. Submit more pictures. This smaller, slimmer Vectrix is the perfect machine for lower-speed urban neighborhood and small-town trips. Its impressive 40-55 mile range* lets you zip past gas stations -and even charging stations- as you go. Price as new (MSRP): US$ 4259. Prices depend on country, taxes, accessories, etc. Comments: Range 40-55 miles (64-88 km) per charge depending on speed. Appox 2 hour charging time. Maintenance-free sealed silicon/lead. Patented Multi-Function Throttle provides regenerative braking and slow-speed reverse. Ask questions Join the 12 Vectrix VX-2 discussion group or the general Vectrix discussion group. 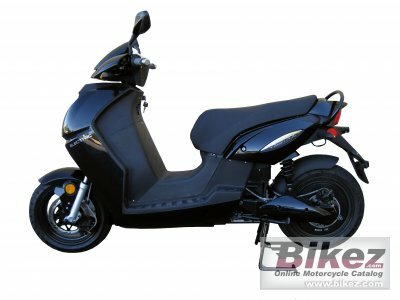 Click here to sell a used 2012 Vectrix VX-2 or advertise any other MC for sale. You can list all available Vectrix VX-2 bikes and also sign up for e-mail notification when such motorcycles are advertised in the future. Ads with or without pictures are easy to create. Our classifieds are completely free with sections for every country in the world. You can also check out our list of related motorbikes. Compare technical data. Look at photos. View your fellow riders' rating of the bike's reliability, design, engine performance, accident risk, repair cost, etc.